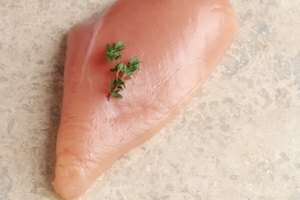 There are two main types of chicken breast fillets – the butterfly cut and the diagonal cut. Both types of fillet create a more consistent thickness and size of cut, so the chicken will cook faster and more evenly. There is also the pocket fillet, used to create a space for holding stuffing. Before working with chicken, remove any other foods from the working area to prevent cross-contamination. Also wash your hands and kitchen utensils thoroughly in hot, soapy water after working with chicken. Look your chicken breast over and if there is a long piece that folds under the breast, this is called the tenderloin. Trim it off and save it for stir-fry or snacks. If the chicken came with skin on and you prefer skinless, you can simply peel off the skin. Trim away any excess fat. To make a butterfly fillet, place the breast on the cutting board and hold it in place by putting one hand over the top of the breast, with the thick end near your fingers and the thinner end toward your wrist. Starting at the thick end, make a longitudinal cut down the length of the fillet, parallel with the cutting board, cutting the breast almost in half, but not quite. Leave the far long edge intact so that when you are done cutting, you can open the breast like a book. This creates a thinner cut of meat that will cook faster and more evenly than a thick breast. It can also be pounded out and breaded, stuffed or rolled. The pocket fillet is similar to the butterfly cut but this time you make a smaller cut and try to leave the ends and part of the near side intact as well. Starting near the thick end, insert the knife about ½ inch away from the end of the breast and carefully cut through the breast horizontally to within ½ inch of the other end. Keep the point of the knife about ½ inch away from the far edges of the breast. This creates a pocket that is better for holding stuffing and fillings than the standard butterfly fillet. 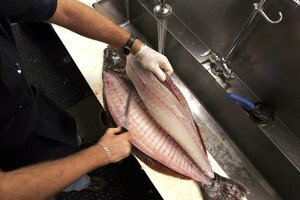 Sometimes a recipe may ask you to “fillet” the breast into 3 or more separate cuts. Since the word fillet is a verb as well as a noun, this simply means cutting the breast into separate servings. 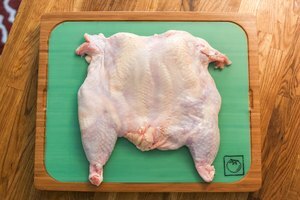 Place the chicken breast on the cutting board as before, but this time do not hold the entire breast. Starting about 2 inches from one end and holding the knife at a 45-degree angle to the cutting board, facing toward the farther end, slice off about 1/3 of the breast. Again holding the knife at an angle, cut the remaining portion into 2 pieces. This type of cut will reduce a 10-ounce chicken breast into three 3.3-ounce servings, which will be easier to roast or grill, and juices won’t be lost as they would if the breast were to be carved later. Chicken is slippery. To make slicing chicken easier, place the breasts in the freezer for 15 minutes to firm them up a little.